Fifteen ‘webisodes’, short films relating to artists and ideas featured in the documentary series, available shortly on this website. 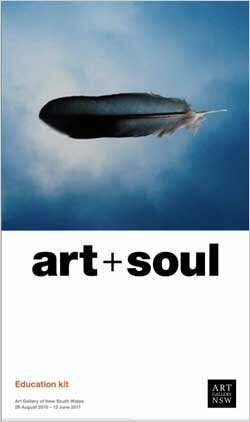 art + soul: Investigate thematic and conceptual links between the work of artists in the documentary series and the exhibition. art + soul: Explore the diversity of Indigenous culture through key themes in the exhibition. Talks in the exhibition with the Gallery’s coordinator of Aboriginal education programs, Amanda Peacock. Focusing on key issues and ideas explored in the groundbreaking documentary series art + soul and the exhibition .